In high school, Ken discovered an avid interest in computers and technology. With college just around the corner, he decided to apply to study IT and pursue a career in web design and development. During his freshman year, Ken discovered Treehouse and began using it as an additional learning resource. When Ken failed his first year, he found himself unemployed, burdened with college debt and in need of a new approach to achieving his career dreams. Ken made the decision to drop out of college and focus on learning solely with Treehouse. He became one of the first students to enroll in the Techdegree program. A few months later, having built up his portfolio and practical skills, Ken applied for a position at a small web design agency in Melbourne, Australia. 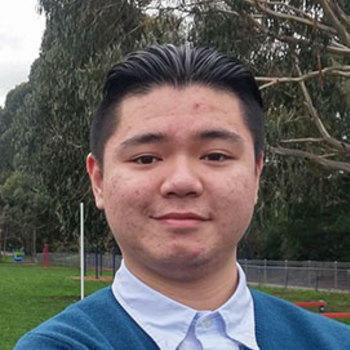 He landed the job and is now a Junior Web Developer at Fat SEO. At 19-years-old – and without a college degree – Ken has been able to launch his career doing something he’s passionate and enthusiastic about. We asked Ken to share his inspiring experience and advice with other students and aspiring web developers. As a kid, I was a very big fan of computer games but my computer was always causing games to crash, restart, lag and was often affected by viruses. It forced me to fix the issues and as more problems occurred it led me to more questions, making me curious and eventually led to my interest in computers and technology. I then began taking computer courses in high school, but they didn’t teach much and the curriculum was outdated. It wasn’t a great introduction to coding, but it didn’t stop me from learning more. Why did you choose the Front End Web Development Techdegree? I chose front end web development as it’s a mixture of code and design, it requires a bit of logic and creativity, the perfect balance for me. Web design and development is also an underrated profession. You always hear people talk about doctors, attorneys, and businessmen etc. but you rarely hear about web designers. As the web hasn’t been around for long, it’s a job that doesn’t occur to everyone. But I believe in this century, technology jobs deserve the same level of respect and recognition as any other professional career. You recently landed a position as a junior web developer at a digital agency. Tell us a little bit about how your career has evolved since learning to code and the experience of getting your first job in the tech industry. I was an unemployed 18-year-old college freshman studying IT and programming when I discovered Treehouse and began using it as an additional learning resource. I eventually failed the first year and decided to drop out of college, leaving me unemployed and $8,000 in debt. I made the decision to continue my education solely through Treehouse from home. I was really happy when Treehouse released the Beta for the Techdegree program earlier this year. I was one of the first members to join and immediately started working on the projects. During this time I also decided to apply for jobs, because why not right? I was an unemployed college dropout but was already building practical skills and experience through the Techdegree program. I eventually got an interview and scored a job at a small web design agency, they mainly focus on SEO marketing and Web/WordPress development. This opportunity would never have been available to me if it wasn’t for Treehouse and failing college. My advice to college students is that dropping out of college doesn’t always lead to failure or consequence. There is more than one path to success. You don’t have to go to college to get what you think you want. My advice to college students is that dropping out of college doesn’t always lead to failure or consequence. There is more than one path to success, you don’t have to go to college to get what you think you want. What would you describe as the greatest benefits of working in the tech industry? The thing I love the most about the technology industry is that you can start from nothing and become something. I’ve had so many problems in my life and I turned it around, that’s basically my life in a nutshell. Another big one is that it’s very fulfilling work, every single industry needs designers and developers, and the work you do really does make a difference. For example, if someone needs a website for their new business you could easily design it and really surprise your client with your skillset. If that isn’t making a difference through technology than I don’t know what is. It’s very fulfilling work, every single industry needs designers and developers, and the work you do really does make a difference. Another awesome benefit is the demand for designers and developers. The job market has changed quite a bit, it’s an amazing field and it helped me get my first job due to the high demand. If Treehouse has taught me anything it’s that web design, in particular, is a possible career for anyone to get into, and you get paid quite a bit as a professional designer. You don’t need a fancy college degree to help you land a job, and you don’t need a $30,000+ loan to start a career. This is my first career I’ve ever had and I never thought I could get a career like this – or even a career at all – without college. My advice again in terms of the tech industry is to always make time to learn. You probably hear that a lot, but it’s important to train yourself to learn. The job I scored is a typical 9-5 job and I’m trying my best to make time and learn to ensure my skills and knowledge don’t become outdated in the future. That type of practice is perfect if you’re in the technology industry. A lot of Treehouse teachers have dedicated themselves to becoming ‘lifelong learners’ (shout out to Nick Pettit, Andrew Chalkley, Guil Hernandez, and Dave McFarland). They have truly inspired me and set a perfect example for all of us. Treehouse has taught me that web design is a possible career for anyone to get into. Treehouse has changed my life, no doubt. I know it sounds cliché because I’m vouching for my school but it has seriously been a game changer for me. I honestly can’t believe online education had such a big impact on my life. I tried many online education platforms, scrolled through hundreds of YouTube videos and blog articles but nothing compared to my Treehouse education. I would probably be working at a miserable job if it wasn’t for Treehouse. To be honest, Treehouse has become an everyday thing to me, it’s a big need in my life now. Treehouse has changed my life, no doubt. I know it sounds cliché, but it has seriously been a game changer for me. I honestly can’t believe online education had such a big impact in my life. Technology isn’t taught in a lot of schools as it’s such a progressive and innovative topic, and even if they did it would most likely be outdated content. The college I went to taught technology but their books, learning materials, and curriculum were just obsolete. That’s where Treehouse is unique. They teach real life skills and technologies that can’t be learned in traditional schools, and they continuously update their content. Steve Jobs once said, “Everybody should learn to program a computer because it teaches you how to think.” Math may be a logical subject to learn in school, but it’s not as logical as a computer. Math may not always get you a successful career, but technology certainly can. Do you have any advice you’d like to share with students who are just starting out? There’s no reason for you to be overwhelmed and afraid when applying for job applications, even if you’re just starting out. The lesson I learned is to not be afraid of job applications and their requirements. Most applications list out the types of technologies they use in their workplace and want you to be familiar with them, not necessarily a master of them. My advice to you is as long as you’re continuously studying and building your portfolio, you’ll fit the criteria of being a suitable candidate for any job.